Ok, so it's not quite done, but lucky for anyone who reads this, I'm impatient. We had our fair share of contractor drama with this kitchen, but the final product is beautiful and we're completely happy. 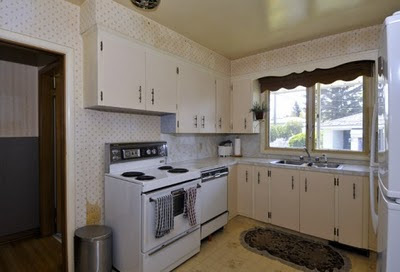 That little rim under the cabinets hides the undercabinet florescent lighting. It's like standing on the sun. New counter and recycling drawer to frame in oven. Contractors installed a wheel underneath the drawer. We still need to remove the rest of the wallpaper and paint - hopefully by next week and add a new ceiling light to replace the florescent exposed tube (hot). One room almost down. Yay us!